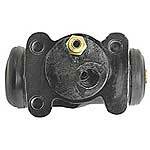 New USA Made master cylinder for the 1939-1948 Passenger car and 1940-1952 Pickup. Includes Rubber Boot & Metal Cap. Master Cylinder Repair Kit for the 1939-56 American Ford V8. for use where the hub fits behind the drum. Note: Requires special proprietary studs 21-A-1107 that are NOT swedged in place like originals. 3-1/4" center hub hole. OD - 12" X 1-3/4"
1940-48 Ford & Mercury V8 Passenger Cars. 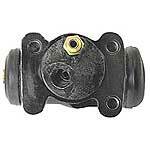 Also used on 1928 & later cars, when converted to the later Ford hydraulic brakes. Also fits some of the American V8 commercial trucks. 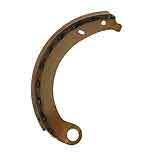 Brake Shoe Cam - Round OD With D Shaped ID. 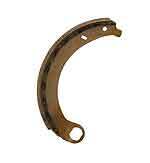 Fits Front Or Rear brake shoes. 11" Front Brake drum for the 1948-52 Ford F1 pickup. Clutch and brake pedal pad set, for the 1949-51 American Ford V8 passenger car. Could be used for many applications. Front Brake Line Connector bolt for the 1939-48 American Ford V8 car and pickup. Brass T connector for the 1939-41 American Ford flathead V8 car and pickup. Brass front brake line T connector for the 1939-48 American Ford V8 car and pickup. V type master cylinder connector with the two outlets, for the 1939-40 American Ford V8. 1939-48 American Ford V8 car and 1939-47 pickup. Also fits other Ford and Mercury variants up to 1958. Rear Brake Hose for the 1939-48 passenger car, and 1939-41 pickup. Length 9 inches. Front Brake Hose for the 1939-48 passenger car, and 1939-47 pickup. Length 15 3/4 inches. Rear Brake Hose for the 1948-60 American Ford V8. Front Brake Hose for the 1948-52 American Ford V8. 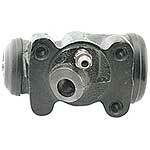 Right Front Wheel Cylinder. This Is A 1942-48 Cylinder Which Will Retro-Fit 1939-41. (Also 48-51 F-2&3 Pickup) However, Replace In Pairs To Maintain Equal Braking Action. Left Front Wheel Cylinder. This Is A 1942-48 Cylinder Which Will Retro-Fit 1939-41. (Also 48-51 F-2&3 Pickup) However, Replace In Pairs To Maintain Equal Braking Action. 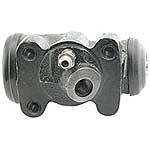 Rear wheel cylinder for the 1939-47 American Ford V8 one ton truck. Right Side Rear Wheel Cylinder for the 1939-48 American Ford V8 cars. Left Side Rear Wheel Cylinder for the 1939-48 American Ford V8 cars. Left rear wheel cylinder for the American Ford V8. Right rear wheel cylinder for the American Ford V8. Right Front Wheel Cylinder for the 1949-56 American Ford V8. Left Front Wheel Cylinder for the 1949-56 American Ford V8. Master Cylinder Copper O Ring Gasket 0.453 ID. 0.687 OD. 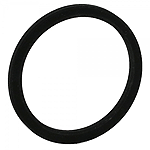 Master Cylinder Copper O Ring Gasket 0.593 ID. 0.812 OD. Copper O Ring Gasket On Master Cylinder. 0.500 ID. 0.812 OD. 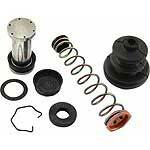 Master Cylinder Rebuild Kit for the 1949-51 American Ford V8. 1939-48 Brake Shoe Spring 6 1/2" long. Sold each. 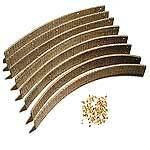 1939-48 Brake Lining Set. 8 Pieces, With Rivets, Passenger & 1939-47 1/2 Ton Pickup. 1939-48 Half Brake Lining Set. 4 Pieces, With Rivets, Passenger & 1939-47 1/2 Ton Pickup. Set of four brand new oval hole brake shoes for the American 1945-48 Ford passenger car and 1942-47 American V8 pickup. These are made from heavy, stamped steel with a bonded lining. Set of four brand new round hole brake shoes for the American 1939-42 Ford passenger car and 1939-41 American V8 pickup. 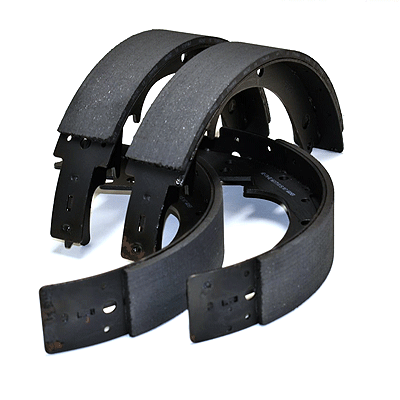 Set of four rear brake shoes for the American Ford V8. These are the hydraulic brake line fittings, for use on steel brake lines. Fits all the 1939-48 Body Styles with hydraulic brakes. Master Cylinder top gasket for the 1939-58 American Ford V8 car and pickup.